"Bungee Run"... This amazing bungee run rental is readily available to lease for your celebration or occasion in Pflugerville! This classic inflatable game features a lot of colors as well as a stretchy cord for your guests to pull against as they race to the end. We run a certified, fully-insured, and family-operated veteran-owned local business. 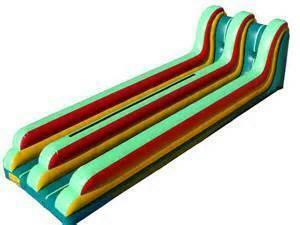 We make use of lead-free as well as USA-sourced products for our inflatables. Our clients get the absolute best in client service. On top of that, we clean and sanitize every bounce house rental by the end of its every usage. You are going to see the amount of care and effort we put into each of our inflatables at the end of your event too! We work with safety and standardized compliance in mind. You can count on us to guarantee a proper lease. We have certainly been around for years and our customer complete satisfaction is a major concern. Do not look past quality, give us a call and rely on us to make your celebration a success. We can provide the Bungee Run Rental to Austin TX as well as any of the following places: Pflugerville, Cedar Park, Round Rock, Leander, Bastop, Buda, Hutto, Wimberly, and Georgetown. We are based in Pflugerville and can accommodate for home parties, church events, festivals, corporate and business special events, and more. Please don't hesitate to send us a helpful e-mail so that we can learn more about each other and speak about the inflatables you are picking out. Our team will get back to you as early as we are able to, and figure out the specifics for your occasion. As an alternative, if you prefer to talk sales with us on the phone, please contact (512) 783-4643. Check out the products below and click the image (or title) for more details. Finally, please contact us to get a reservation. We can also get in touch by talking over Facebook.